VSB Engineering College & VSB College of Engineering, Karur, Covai has advertised for recruitment of Professor / Associate Professor / Assistant Professor jobs vacancies. Interested and eligible job aspirants are requested to apply within 10 days from 06th February 2019. Check out further more details below. 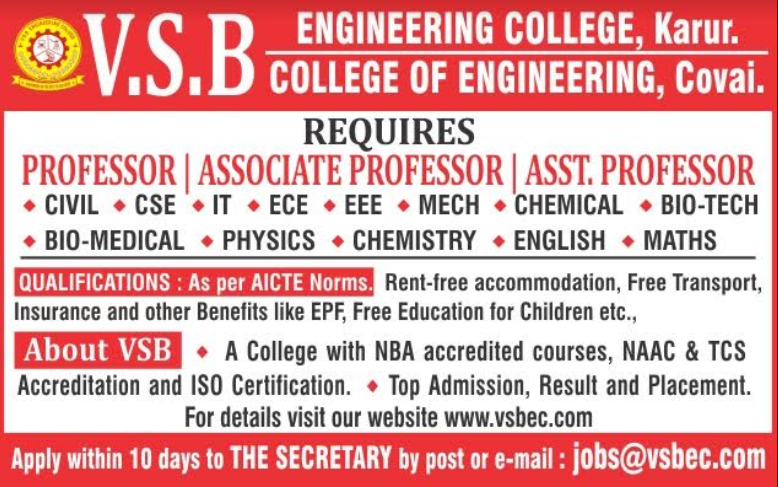 College Profile: VSB College was established by V.S.B. Educational Trust in the year 2002. A College with NBA accredited courses, NAAC & TCS and ISO certification. Self-financing co-educational institution with an objective to afford value-based technical education and mould the students for industry requirements. How to Apply: Interested and Eligible candidates may send their resume along with recent passport size photograph and necessary documents to THE SECRETARY by Post or Email address within 10 days.